Is your garage primarily for storage or can you still park your car there? Most Los Angeles residents find storage space a premium and use their garage to supplement the lack of closet space. There’s nothing wrong with that unless you are holding onto a lot of useless clutter. It might be a good idea to dedicate a Saturday morning to sorting through everything in your garage. You only have to make two piles: keep or haul away. Of course, you don’t have to do all the hauling yourself. This is a perfect job for Junk King Los Angeles. 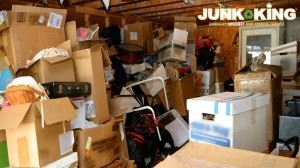 These are junk removal professionals who have a lot of experience clearing out clutter from garages all across the city. They’ll back the truck right up to your garage door and load everything up in a very short amount of time. Once all that clutter is gone, you’ll be able to organize the things you’re holding onto. This will make finding things like holiday decorations and other household goods a lot easier. Just as you should fill up your garage with unwanted clutter, you also shouldn’t way space in your closet with things you know you’re not going to use. A good test is the one-year rule. If you haven’t worn an outfit in over year, then there is a good chance that outfit might not be want to get. The Junk King crews will collect all the things you’re piling up from your closets throughout the house. You don’t have to bring anything down from upstairs. This is also a good time of year to go through all your kitchen cupboards and pull out the stuff you’re not using. You may discover long-lost gadgets. It might also be expired can goods that should be tossed out in the garbage. The rest of the clutter can be turned over to Junk King Los Angeles. Your home will look and feel a lot better this fall once all the unwanted clutter is hauled away by Junk King Los Angeles. This entry was posted in LA Junk Removal and tagged clutter, fall, hauling on August 28, 2017 by Junk King. Last updated August 28, 2017 .